Mandsaur : Fresh violence erupted in Madhya Pradesh on Wednesday as protesting farmers indulged in arson, a day after the police gunned down up to eight peasants demanding relief from debts and higher crop prices. 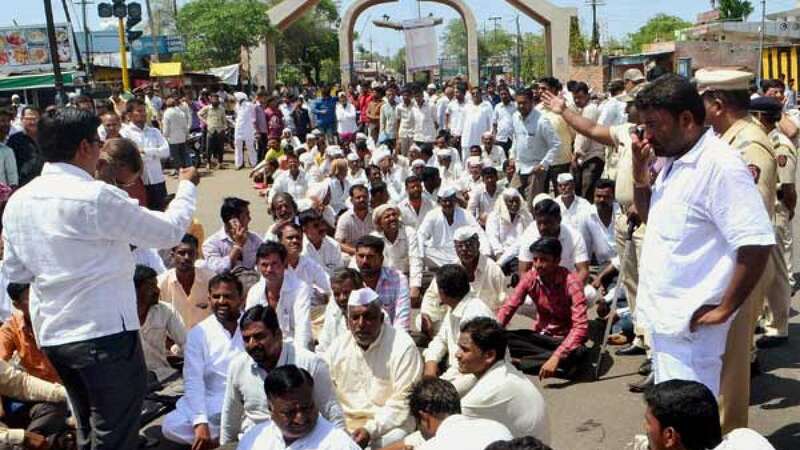 Hundreds defied curfew in Mandsaur where police opened fire on Tuesday at a mob of farmers, leaving five dead according to official count and eight according to farmer leaders. And some 200 km away, a group of farmers marched to a police station in Dewas district and set fire to vehicles parked there. The government of Chief Minister Shivraj Singh Chouhan tried to douse the fires by announcing financial compensation for those killed in the violence and said he was ready for talks with farmers. "I am a farmer and understand your problems. You can be assured your government will implement all promises," Chouhan tweeted, urging people to maintain calm and not pay heed to rumours. In New Delhi, Prime Minister Narendra Modi, who has promised to double farmers' income by the end of his first term in 2019, met Home Minister Rajnath Singh, Finance Minister Arun Jaitley, External Affairs Minister Sushma Swaraj and Road Transport Minister Nitin Gadkari. The Home Ministry has sent 1,100 anti-riot police to Madhya Pradesh. The extra forces would be deployed in violence-hit Ujjain, Dewas, Mandsaur, Neemuch and Sehore, an official said. But tension was still high as angry farmers blocked roads and also attacked two senior officials at Mandsaur. Mobile connectivity has been cut and thousands of police in riot gear were deployed. Mandsaur District Magistrate Swatantra Kumar Singh and Indore Superintendent of Police O.P. Tripathi were roughed up when they reached Barkheda Pant where the farmers were squatting on a road with the body of one of those killed on Tuesday. "The violence is very unfortunate. The Congress is trying to give it a political angle," Union Information and Broadcasting Minister M. Venkaiah Naidu said. The Congress and the Left said the deaths in Madhya Pradesh proved that the Modi government had no strategy to help debt-ridden farmers in a drought-hit region. "Farmers were seeking loan waivers and right price, but the BJP killed them. This is the sad reality of Mandsaur," Congress leader Abhishek Singhvi said. Farmers in Madhya Pradesh and Maharashtra have been protesting crop prices since June 1, complaining that their incomes have not risen despite steady hike in agricultural production. The demands for loan waiver gained momentum after the Uttar Pradesh government led by Chief Minister Yogi Adityanath waived off nearly Rs 36,400 crore worth of farmers' debt. The farmers in Madhya Pradesh have threatened to intensify their protests and accused the government of spreading lies about the number killed. Aam Kisan Union founder Kedar Sirohi said: "By branding us anti-social elements, the government is adding fuel to the fire. On the one hand the government has unleashed repression on us, and on the other it is trying to defame us." The Congress extended support to a shutdown called by farmers in Madhya Pradesh on Wednesday.